Sometime ago, I was chatting with Alex Butterworth (currently working with Oxford ASPIRE project on the Box of Delights project) as I had bumped him into again by accident. I had recently read Beatrice Hitchman‘s novel Petite Mort or, a little death and had the notion of Pepper’s Ghost in my head. Doing some research, I also got back into the possibilities of camera obscura as well. We got talking about “junk tech” and re-using existing technology rather than necessarily buying new kit or parts each time. School science kits and sections in department store offers so much more than they used to (although the kits were fun a few years ago as well). Having taken a few days off and kept some old tomato boxes from the recycling, I began to play with the ideas. One of my criterion was to be able to eventually use my phone as the lighting object and enable it as a projector. A nearby Poundland store provided some cheap hand sized mirrors to do some basic construction. The ubiquitous duct tape (actual tape rather then Perl) and craft and kitchen knives were also used. 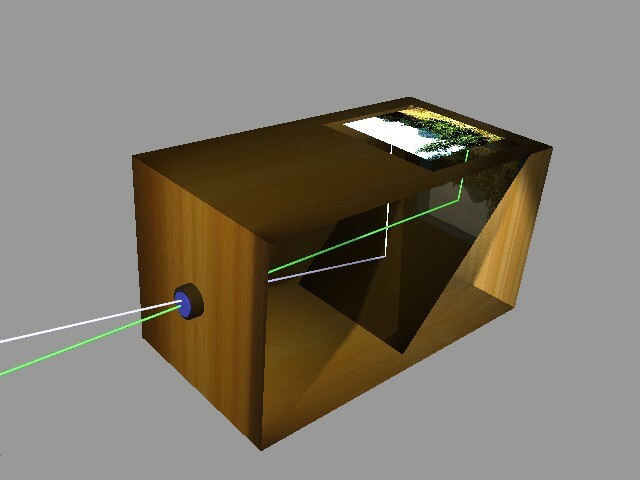 Construction of a very basic camera obscura is wonderfully simple. It is simply a mirror angled in a dark box. A lens at one end (or a simple hole for the light to come in but a lens allow for some focus) lets the light in which hits the angled mirror and projects upwards. The image itself is inversed but you can play with mirrors to correct this. In essence , this is creating a pinhole camera with lenses rather than exposing the light on film on a backplate. Borrowing the hidey hole from a slightly miffed cat (because it was dark enough to see if anything was happening), I angled the mirror at a rough 45 degrees, cut a small hole for the lens (well, where the lens will go) and a hole above the mirror to actually see the inverse object. I just used the home screen on my phone to verify that I could see something. Happiness. The image shows up without a lens but perhaps needs more brightness. For a giggle, I reversed the flow so that the phone was put where the eye had been. Not surprisingly it, creates a blurry projector (a future project that I want to play with at some point (Make magazine’s article on it)) but I could not see much. No lens. I did get light though and some odd looks from the cat who was wondering what I was doing with the place where she sleeps. So for a quick bit of box butchery and messing with mirrors, a quick solution for something that has been in my mind for a bit came together. I want to push this further and attach a phone some how (app?) to a service to show other images or texts via it onto a screen. I suppose this came back to me when the company behind the audience with Les Dawson were being interviewed about how they managed to “resurrect” him so long after his death, although Tupac had also enjoyed (?) the same fate before when he performed with Snoop Dogg and Dr Dre and before that as well. What I need to do, apart from the projection, is to look into the film options and see what can be made from kitchen film or whether I would need to find some reflective film. The Pepper’s Ghost idea has some real promise to it, I feel as do camerae obscurae , or camera obscuras (discussion on this FAQ page but personally I find the Latin more comfortable but knowing me I’ll shift between the two versions). What I have got out if this is the translation of ideas from a Moleskin notebook to an understanding of the basic principles so that I can move on and develop effectively. Also, I can reuse the tomato boxes for something now without just recycling them.